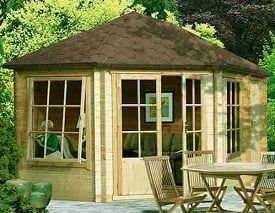 The Villandry corner log cabin is the ideal combination of shed and summerhouse - or perhaps store and workshop. The building will tuck neatly into a corner of the garden and provides a recreational summerhouse area to the front with large top hinged windows and double doors with a smaller shed area with single door behind. It's also marketed in right and left handed versions as the Leygrove or Rowney. The building is completed in quality 28mm FSC approved pine log cladding with a solid board floor and roofing, the latter finished in high grade felt. The floor joists are manufactured of pressure treated timber for durability and the windows glazed with true glass. The doors feature a key operated lock for security. The dimensions of the corner summerhouse portion of the building are approximately 2.75 x 2.75m (9' x 9') and the shed area 2.75 x 1.4m (9' x 4'6''). The eaves stand at 2.00m (6'7'') high and the double door opening measures 1.74 x 1.5 m (5'8'' x 5'). Roof ridge height is 2.75m (9'). Apart from the floor joists the Villandry corner summerhouse/log cabin is supplied untreated. A suitable finish will require to be applied by the purchaser and maintained on a regular basis. The building is delivered with full instructions to kerbside or driveway ready for assembly by two adults. The estimated time for construction assuming favourable conditions and excluding the application of a suitable decorative/preservative finish is 4 - 6 hours. We are a little sceptical about this timescale given the complexity of the construction but the instructions are very clear and contain plenty of advice on avoiding common mistakes and pitfalls. You can see them in full here (opens in a new window) so you know exactly what's involved before you buy. If you own a Villandry, Leygrove or Rowney Corner Summerhouse we'd be delighted if you'd submit a review to help other prospective customers. You can do this on our Corner Summerhouse Review Form - we look forward to hearing from you.